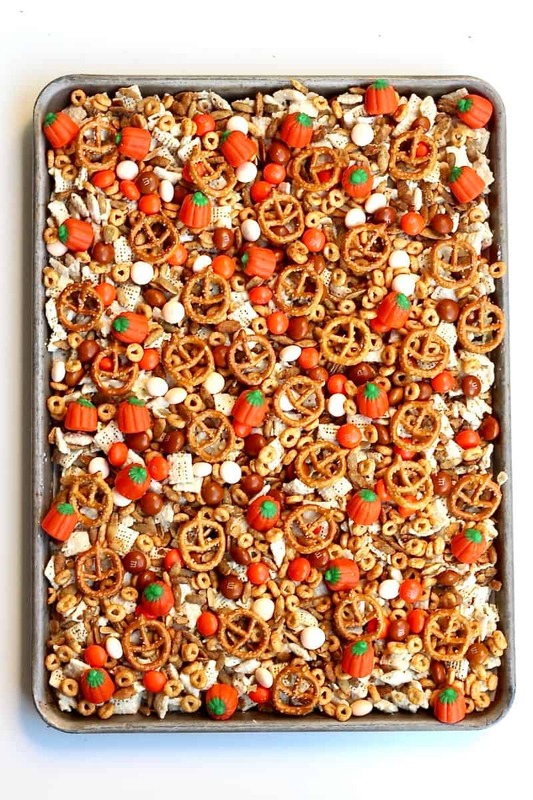 Pumpkin spice and everything nice in this sweet and salty snack mix that’s so perfect for fall! You’re sure to fall in love with this pumpkin spice snack mix at first handful. It’s crunchy and chewy, sweet and salty, and spiced just right. 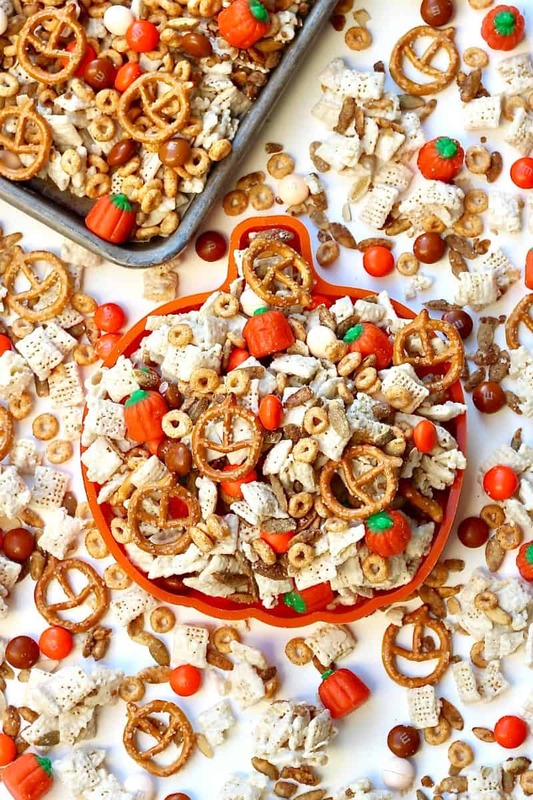 A pumpkin spice lovers dream snack mix! If you know me, you know I’ve got a thing for festive snack mixes. No matter the occasion, I could probably come up with a festive snack mix to compliment it. I love making them and, of course, eating them! They’re so perfect for parties or just to have in a jar on the kitchen counter to snack on throughout the season. 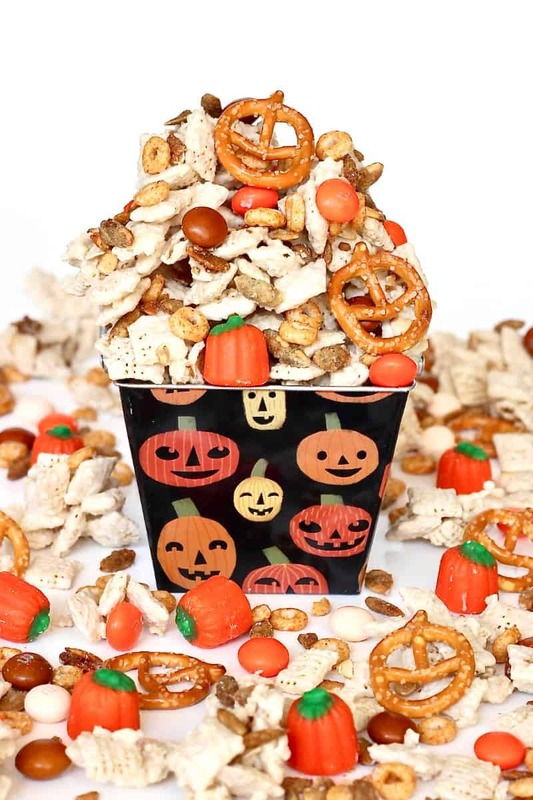 My candy coated snack mixes are always a huge hit and it’s about time I created this pumpkin spice spin on my favorite snack mix. With pumpkin spice Cheerios, pumpkin pie M&M’s and pumpkin spiced pumpkin seeds, it’s got the pumpkin spice flavor going on in every blissful bite. The pretzels add saltiness while the pumpkin shaped candy gives a cute sweet chew. 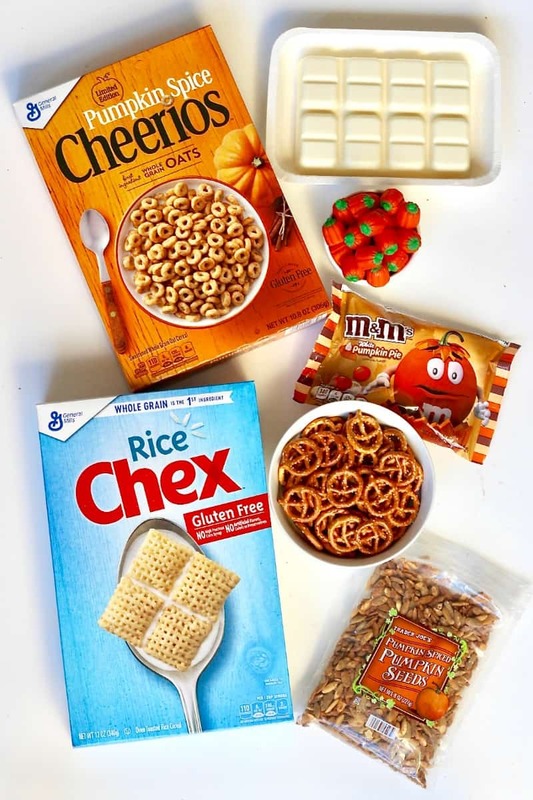 You just melt the candy coating and toss the Chex cereal evenly in it before spreading the cereal out and topping it with all of the other goodies. That’s all there is to it! It’s so easy to make and so great for a quick sweet treat that will feed a crowd. Whether it be for a fall festival, Halloween party, gift giving, or just a sweet treat to snack on at home, it’s sure to be enjoyed! In a large bowl, add the Chex cereal. In a microwave safe bowl, melt the candy coating according to package directions, usually 2 minutes, stirring every 30 seconds until melted and smooth. Be sure not to over melt the candy coating as it will burn and become too thick to stir and coat the mix evenly. Pour the melted candy coating over the Chex cereal in the large bowl and toss to coat with a large spoon. Cereal should be evenly coated in the candy coating. Spread the coated cereal in an even layer on parchment paper. Immediately sprinkle with the pumpkin seeds and then the remaining ingredients. Allow mixture to cool completely. Break apart to serve. Store in an airtight container or baggie.